I came across this book of short stories at my library, and it really is quite good, especially if you're looking for haunting short stories where the ghosts remain off stage. Roald Dahl is the author of James and the Giant Peach, Charlie and the Chocolate Factory, Matilda, The Witches, and The BFG. These are all true and wonderful children's books, where the adults are heartless or at least, inept and unhelpful. So I thought I'd give this collection a chance. 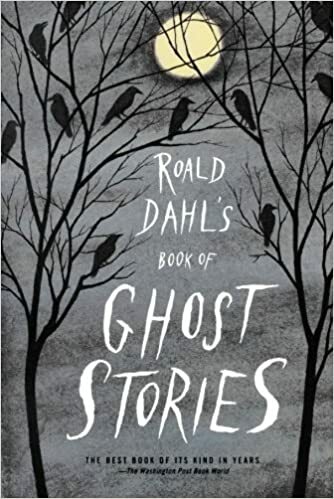 Dahl compiled this collection of short stories by reading over 750 ghost stories in a row, across all styles and time periods, and from famous and unknown authors. Then he winnowed it down to those that left him feeling not scared, but rather, haunted. This is not a collection of gore and violence, and this is not bizarre fiction. Rather these stories give the reader the "brush of a ghostly presence". And of course, a delicious turn of events at the end of each short story. This is the perfect read for Halloween. Dahl did an excellent job in curating these stories, and I especially enjoyed the misdirection of "The Corner Shop", the overt stuffiness of "The Ghost Hand", and the commonplace fright of "Harry". *On this post, I used an Amazon Associate link. so I earn from qualifying purchases. I will use all funds to purchase my usual 18lb bag of candy corn. That's Brach's brand, not that cheap knock off stuff. Life is too short to skimp on candy corn.